The rise of the German Empire under Prussian leadership was in full swing during the mid 1800’s. For the first time, the army, which up to this time had been made up chiefly of the Prussian aristocracy and peasantry, was opened up to the middle class. This, combined with sweeping economic and political changes occurring throughout Europe, led to a rise in the status of the middle class within the Empire. With this rise came increased privileges regarding land ownership and hunting. In previous centuries, it was usually only the kings, prices and nobles who had the right to hunt, and they owned vast tracks of land for this purpose. However, as the wealth of middle-class Prussia grew during the 1800’s, merchants, professionals, and other middle-class citizens were able to purchase or lease land for themselves on which, of course, they could hunt. In Germany dense forests blended with open fields and housed all types of feather and fur, including grouse, rabbit, fox, deer, wolves and wild boar. It was there that the Teutonic hunters wanted to create a breed of hunting dog that could effectively hunt all types of game in all types of terrain that their country had to offer. They wanted a dog with a nose sensitive enough to locate game at an acceptable, useful distance. Because German hunters typically hunted on foot, they also wanted a dog that had enough discipline and inbred instinct to remain staunch on point once the game was located to allow hunters time to close in on the quarry. A hunting partner was needed that would retrieve fallen game for them both on land and in water. In addition, the dog needed to be bold and aggressive enough to interact with and track larger game such as wild cats, foxes and deer within the deep German forests. Finally, and very importantly, these hunters wanted a household companion that could be relied upon to protect the home and those in it effectively when called upon to do so. Keeping all of these qualities in mind, the seed of this dream was effectively planted, and the work was begun to develop such a dog. 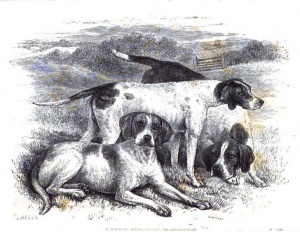 Many different theories exist regarding the actual origins and ancestry of the German Shorthaired Pointer, but most experts believe that the breed development was initiated by a cross between the old Spanish pointer and traditional continental pointers, including the old German pointer and Braque Français. German hunters decided to further cross the breed with tracking hounds such as the German Bloodhound and French Gascon to further enhance scenting ability and to soften the temperament of the emerging breed. The genes of these German tracking hounds also helped to overcome many of the unwanted or undesirable characteristics of the traditional pointers, including reduced trailing ability, a natural aversion for water work, and a noted lack of aggressiveness toward predators. Even with all these improvements, early breeders were not satisfied. The dogs that were created from the previous crosses were proving to be too slow in the hunt and lacking in true agility. In addition, these hunters liked the scenting prowess that came from the bloodhound, yet didn’t want their new breed to look like a bloodhound. 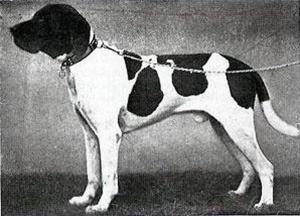 As a result, during the 1860’s, still another cross was made with the English pointer to improve the speed, style, looks and pointing instincts of the breed. The end product of all these effort was a sleek, good-looking, intelligent, loyal and versatile gundog with incredible stamina, an acute sense of smell, a highly developed pointing instinct, and an eagerness to retrieve fallen game either on land or in water. Now the German hunter had a companion that could trail and scent both furred and feathered game, could point and retrieve game birds, and had the size, strength, and courage to interact with larger game such as deer, fox and boar. These dogs were real performers. In 1872 the first GSP made its way into the German Kennel Club Stud Book. His name: Hektor 1 ZK 1. Eleven years later, two GSPs named Nero and Treff competed against each other in the German Derby of 1883. As it turned out, both would end up becoming great foundation dogs for the breed (Nero’s daughter Flora would later produce three offspring named Walden, Waldo and Hertha, all of which can be credited with laying the foundation of many of the pedigree lines in the USA seen today). The popularity of the new breed soon spread across the European continent. 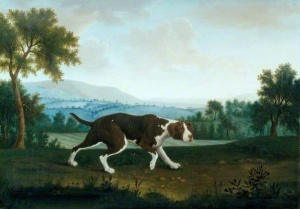 Britain was slow to accept the breed’s popularity, owing to the fact that much of the hunting done here was accomplished on horseback and in open fields. This type of hunting required a dog with a much broader range and speed than the GSP could provide. In addition, national pride in the English pointing breeds undoubtedly contributed to this slow acceptance of the GSP. In 1887 the GSP did appear on exhibit in England at the Barns Elms Show. However, its introduction was short-lived, and GSPs were not seen with regularity in Britain until after World War II. The Breed’s popularity continued to flourish on the Continent, and in 1891 the Klub Kurzhaar was founded for the purpose of maintaining the standards and guidelines for this new and exciting type of sporting dog.